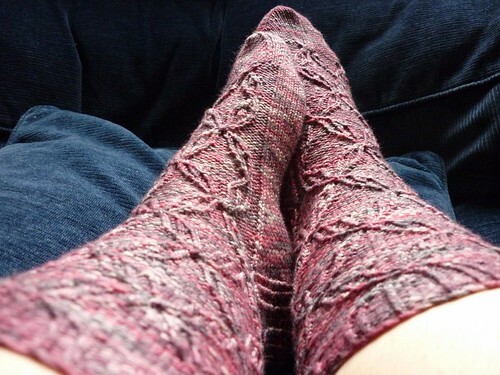 It felt like these socks took forever to knit. Partially because I knit almost three of them. The first one was out of Nerdclub2000’s Elementary Sock in Macbeth’s Tartan, but after the gusset decreases, I frogged it. Weird pooling and I really didn’t like how the colors looked in reverse stockinette stitch. So now I’ve got a pair from Araucania Ranco Multy in some random number color. I love how the Ranco feels and knits up. I’d probably be happier with these socks if I hadn’t had to rip out the first one. But at least they’re done. And they’re mine. All mine! In other news, I will not be renewing my passport in London this week like I thought I would. I’m still going to London, since we have our train tickets and the time off work, but if I can renew it in Finland for much cheaper, then I will. Seriously, £105 to renew it in London (that’s with normal delivery!) or 53€ for the exact same thing in Finland. Now, since I don’t have a week to hang out in Finland, I’ll be paying a bit more to get it done the same day (82€/£71), but it’s still cheaper than London. Ridiculous. Ridiculous prices.